Specify the Primary and Secondary barcode values of Documents mode. Secondary barcode is shown only if Two Barcodes is selected in Profile panel. Barcodes contain data strings that can be partitioned into named variables, and those variables can then be used to name files and/or folders, alone or in combination. Define barcode type or symbology expected to be on an input page. The Types are classified as: 1-D, 2-D, Retail, Postal and Specialty, in order to simplify the selection. Select orientation of expected barcode. If not known select Any Angle. Note: Session processing time depends on the number of selected orientations. Select only orientations you are really interested in. Select validation criteria for barcodes to be reported. If criteria is specified and barcode value does not match criteria, barcode is ignored. Often images contain barcodes coming from various sources. For example, page might contain popular Code 39 labels placed by some user for their own purposes. The goal of Filter is to limit reported barcodes to ones expected by Barcode Director user and ignore others. User that has control over barcode value is advised to design "well-known" barcode value pattern that unlikely to be used by others. Length in range - Barcodes are accepted if number of characters in barcode value is within limit in the From and To fields. Starts with Pattern - Barcodes are accepted only if value starts with specified Pattern string. Pattern Match - Barcodes are accepted is value matched against specific Pattern. ASCII characters will be matched exactly. Clicking down arrow on the right allows to specify any alphanumeric character (identified by ã) or any number (identified by ñ). In addition the rest of the value can be identified as any length alphanumeric string (identified by Ã) or any length numeric string (identified by Ñ). If Ñ or Ã are not present length of barcode value should be exactly the same as length of the Pattern. In this example, the valid barcode value must start with ABC followed by any three digits, a -, and then any sequence of digits to the end of the barcode. For example ABC345-5678 is valid, while ABC345-5A78 is invalid. Optionally identify named portion of barcode value (sub-field) to use in output file/folder names. Single barcode might be designed to contain distinct pieces of information, e.g. account number, form number, page number. Business process might require different use for each portion. E.g. account number is used to name a folder, where form number is to name a document. This group of fields provide a tool for such processing. Use Add, Rename, Delete buttons to manage user defined fields. Note: Deleting or renaming filed that is already referred on Output panel will cause runtime error. User Defined Fields are not available for a Secondary barcode if it's use on Profile panel is "on primary barcode page as alternative type"
Use this selection to give a name to the whole barcode value. In this example all barcode value is named Serial_No. Defined starting position and length of barcode substring. Zero (0) in the Length extends substring to the end of barcode value. In this example, the first 6 characters of the barcode named Part_No. Sometimes barcode value contains fields separated by printable character. Character | is often used. 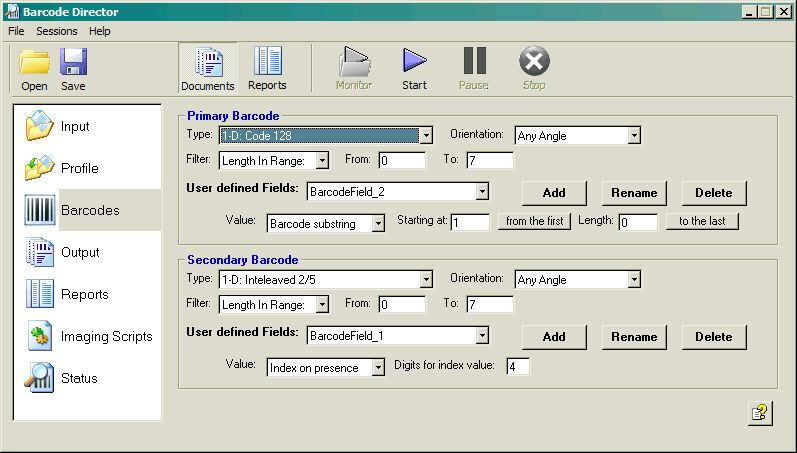 This mode splits barcode value using separator character and identifies filed to be assigned to named field. Characters before the first separator is a filed number 1. For example barcode contains at least 3 fields, separated by "-" (e.g. abc-xyz-123). Filed test is defined as the 3rd field and thus will have value 123. If the barcode value is non significant, then what matters is only its presence. Each time the barcode is read, a counter increments and the document is partitioned. The barcode could be the same value as its predecessor, for example a separator sheet printed once and copied many times, or a patch sheet with a patch barcode. It could also be a different barcode value - as long as it is a valid value. Digits for index value sets length of index filed. If index number is less then specified number of digits, field is left-padded with zeros(0). For example index value 23 and Digits for index value of 5 translates into field value of 00023. Presence of barcode forces creation of a output file with a unique file name in output folder. For example Output panel specifies file name as ABC<BcValue1-SeparatorIndex>. After barcode is found, the index is incremented from one (1) and up. For each value an output file name is created: ABC0001.tif, ABC0002.tif, etc. Once a new file name is found, that does not already exist in the output folder, the incrementing is stopped and a new name is assigned to the new output file. Assuming files ABC0001.tif, ABC0002.tif, ABC0003.tif are present in output folder, the file ABC0004.tif is created. The next barcode will create the file ABC0005.tif, etc.